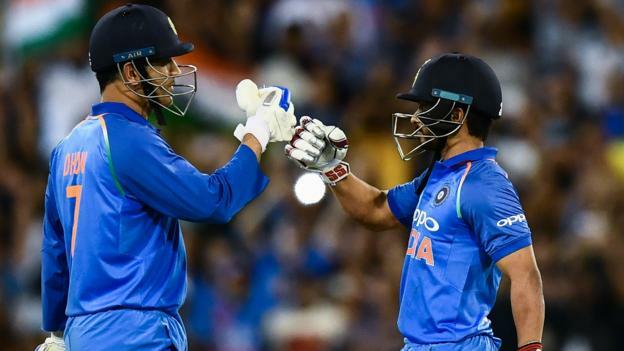 BBC – MS Dhoni scored a third successive half century to guide India to a seven-wicket win against Australia and clinch the one-day international series 2-1. MS Dhoni scored a third successive half century to guide India to a seven-wicket win against Australia and clinch the one-day international series 2-1. Captain Virat Kohli, who went on to score 46, was dropped by Peter Handscomb at slip on 10, while Glenn Maxwell dropped a straightforward chance at point to remove Dhoni first ball, while both should have also been run out early in their partnership. Dhoni was also dropped in the 48th over by captain Aaron Finch with India needing 27 runs from the final 18 deliveries, but the former India skipper never looked flustered as he and Jadhav saw the tourists home. The 37-year-old middle-order batsman was named player of the series in recognition of his 193 runs over the three matches – a marked improvement to Dhoni’s form in 2018, when he managed just 275 runs from 20 ODIs. “As a team we are very happy, but more than anything I think he must be very pleased that he is amongst the runs and feeling confident about his game again, which is very important for a batsman,” said Kohli, who replaced Dhoni as one-day skipper in January 2017. Previous articleEvery Royal Rumble match winner: Where are they now?